Dr. Carl Kell won’t be running in the Med Center Health 10K Classic on Saturday (Oct. 13), but he will be crossing the finish line. 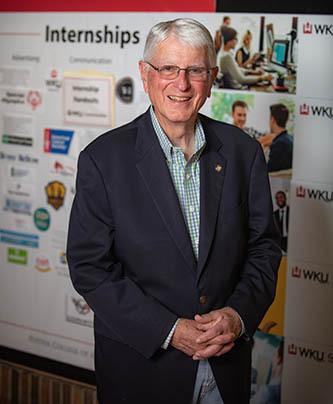 Dr. Kell joined the WKU faculty in 1972 and began running in the mid-1970s. As interest in road running and 10K races grew, he and others in the community began developing plans for the first 10K Classic in 1979. In its early years, the race attracted a field of elite runners from the United States and other nations and was televised on ESPN. Bowling Green became a premier location on the 10K schedule because it had a certified course, top runners and community support. “It wasn’t just another race, it was an event,” Dr. Kell said. In 1988, the race name was changed to The Bowling Green 10K Classic. In 2000, The Medical Center became the title sponsor. Over the years, the event has added a 10K wheelchair race, a 5K run/walk, a 3K fun walk and the Children's Classic. “Thousands of people have come through the streets of Bowling Green and tens of thousands of dollars in prizes given away,” Dr. Kell said. Among Dr. Kell’s memorable 10K moments: The finish line arrest of a runner who was behind on alimony and child support payments; and the morning a top runner from Africa took cover during a storm then outran most of the field to finish fourth. Jeff Younglove, retired director of Campus and Community Events at WKU, said Dr. Kell has been a recognizable fixture of the 10K Classic. “Those who have been involved with a lot of 10Ks would certainly know the name Carl Kell and his involvement with it,” he said.